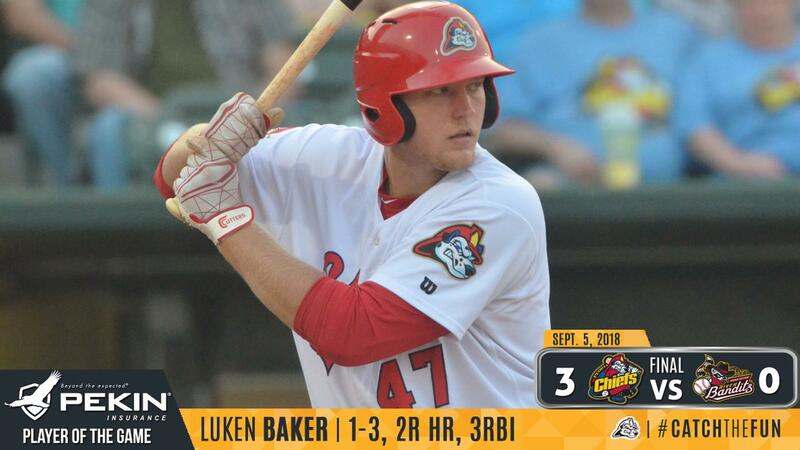 Peoria, IL - The Peoria Chiefs shut out the Quad Cities River Bandits 3-0 on Wednesday night in game one of the Midwest League Western Division Semifinals. Game two of the best-of-three series is set for Thursday at 6:35 p.m. in Davenport, Iowa. The Chiefs got on the board in the bottom of the fourth via the long ball against River Bandits starter Edgardo Sandoval. Yariel Gonzalez drew a leadoff walk and stole second base. Luken Baker drilled a two-run homer over the fence in left field for an early 2-0 lead. With starter Johan Oviedo cruising on the mound, Peoria tacked onto their lead in the bottom of the fifth against reliever Leovanny Rodriguez. Nick Dunn slashed a leadoff double down the left-field line and Nick Plummer walked to put two runners on with nobody out. Gonzalez placed a single up the middle to load the bases with one out. Baker pushed across Dunn from third on a sacrifice fly to center as the lead widened to 3-0. Oviedo (1-0) earned the win tossing six scoreless innings allowing three hits with four walks and seven strikeouts. Robbie Gordon pitched 1 1/3 scoreless innings on one hit with no walks and two strikeouts. Patrick Dayton pitched 1/3 of an inning without allowing a hit with two walks and one strikeout. Kodi Whitley earned the save throwing 1 1/3 scoreless and hitless innings with no walks and one strikeout. Notes: The Chiefs are in the playoffs for a franchise record fourth consecutive season...Peoria recorded its first playoff shutout win since September 3, 1986 at Springfield and its first ever shutout win in a home game... Baker recorded his first professional playoff hit, home run and RBI...The game entered a rain delay in the top of the eighth inning with one out...The delay lasted 48 minutes...The Chiefs won game one of the first round last year against Quad Cities at Dozer Park 4-3...Peoria improved to 13-7 all-time at home in the playoffs and 9-4 at Dozer Park...The Chiefs earned their 20th playoff win in franchise history...The Chiefs have lost five straight playoff games in the state of Iowa dating back to a Western Division Finals game one win at Cedar Rapids exactly 16 years ago Thursday…Game two of the playoffs is Thursday at 6:35 p.m. at Quad Cities…The Chiefs will start RH Zach Prendergast (7-4, 3.08) against Quad Cities RH Chad Donato (6-0, 2.04)…The broadcast with Voice of the Chiefs Nathan Baliva can be heard, starting with the Pre-Game Show at 6:20 p.m. on www.peoriachiefs.com/listenlive and is also available on the Peoria Chiefs Network in the Tune-In Radio App…The game is also available to subscribers on MiLB.TV.